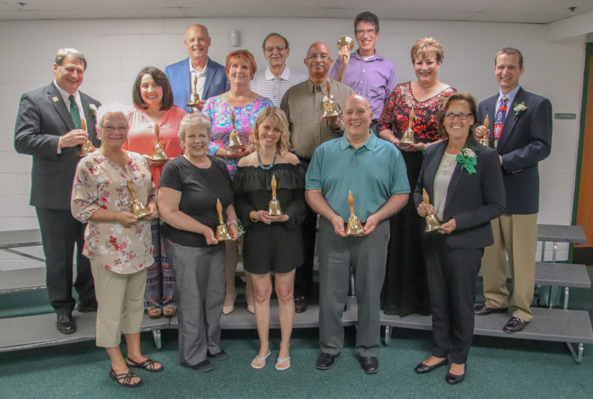 The Pattonville School District honored staff and volunteers who serve Pattonville children during its annual District Appreciation Night on May 7. Take a look at the honorees from this special event. Pattonville announced honorees for the district-level awards. Find out more here. Individuals honored with the Pride of Pattonville Award in recognition for outstanding service to Pattonville students and schools were, from left, front row, JoAnn Greenwell, curriculum and instruction specialist at the Pattonville Learning Center, Sue Boswell, activities department secretary at Pattonville High School, Michele Hill, English language teacher at Willow Brook Elementary School, Sue Stricklin, parent volunteer in the district, and Lois Westbrook, district substitute; and back row, Mike Siebe, district social worker, Melynda Lamb, choir teacher at Pattonville High School, Mary Jo Crabtree, district substitute, Brian Bateman, Pattonville High School Robotics Club volunteer mentor, and Joyce Bowdish, call center coordinator at the Pattonville Learning Center. Retirees honored with School Bell Awards and their years of service in Pattonville include, from left, front row, Elaine Behrle, printing specialist in the printing department, 26 years; Penny Britton, parent educator in the Parents As Teachers program, 20 years; Jennifer Zurweller Ballmann, kindergarten teacher at Bridgeway Elementary School, 24 years; Tom Noble, academic intervention specialist at Parkwood Elementary School, 19 years; and Bridget Jordan, director of food services, 4 years; middle row, Dr. Mike Fulton, superintendent, 23 years; Rita Brengle, administrative assistant to the superintendent, 20 years; Lara Sweda, sixth-grade English language arts teacher at Holman Middle School, 27 years; LaVon Whitman, mail courier in the printing department, 12 years; Joyce Bowdish, call center coordinator at the Pattonville Learning Center, 36 years; and David Caldwell, physical education teacher at Drummond Elementary School, 25 years; and back row, John Gaffney, building custodial supervisor at Pattonville High School, 27 years; Harold Willman, bus aide in the transportation department, 13 years; and Nathan Bachelder, Spanish teacher at the high school, 28 years. Sharon Basinger of Karate STL and Raising Cane's in St. Ann were named Pattonville's School-Business Partners of the Year for their support of Pattonville students and programs. 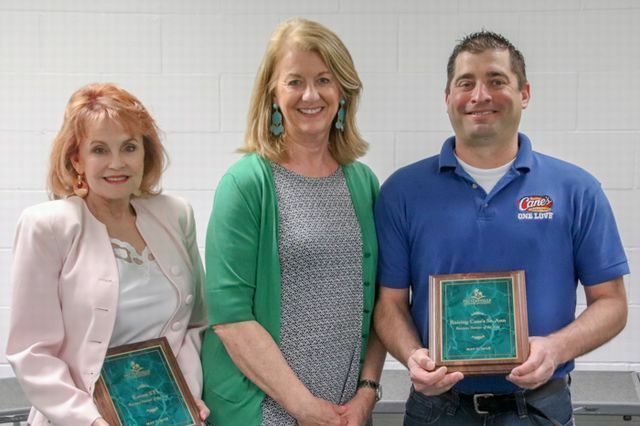 Basinger, left, and Bryan Brzycki, manager of Raising Cane's, right, are shown with Patty Gould, Pattonville's director of school-business partnerships. Kenneth Jordan, a maintenance journeyman, was honored for serving Pattonville for 40 years. His grandson, Dawson Jordan, left, accepted the award on his behalf. Honored for 30 years of service were, from left, Roy Libhart, facilities supervisor, Jaycyn Schnell, second-grade teacher at Parkwood Elementary School, and Robin Porzelt, second-grade teacher at Bridgeway Elementary School. Honored for 25 years of service were, from left, front row, Dr. David Miller, director of assessment, David Caldwell, physical education teacher at Drummond Elementary School, and Marlon Gilkey, custodian at Rose Acres Elementary School; and back row, Ruth Ronecker, clerk at the Pattonville Learning Center, and Tammy Davis, parent educator in the Parents As Teachers program. Honored for 20 years of service in Pattonville were, from left, front row, Tonya Ferretti, English learner teacher at Parkwood Elementary School, Christopher Benbow, Spanish teacher at Pattonville Heights Middle School, Penny Britton, parent educator in the Parents As Teachers (PAT) program, Lori Connors, parent educator in the PAT program, Jolene Hilligoss, Special School District (SSD) teacher at Rose Acres Elementary School, and Evelyn Jones, SSD paraprofessional at Parkwood; and back row, Anne Kloeckener, nurse in the PAT program, Steve Smith, physical education teacher in the Positive School at Pattonville High School, Rita Brengle, administrative assistant to the superintendent, Pamela Davenport, second-grade teacher at Remington Traditional School, and Joyce Lindsey, cook at Holman Middle School. Honored for serving Pattonville for 15 years were, from left, front row, Sandra McIntyre, paraprofessional at Parkwood Elementary School, Linda Stuckey, custodian at Pattonville High School, and Valerie Wanner, cook at the high school; and back row, Brenda Vitale, bus driver, and Michele Hill, English learner teacher at Willow Brook Elementary School. Honored for 10 years of service in Pattonville were, from left, front row, Adam Hall, band teacher at Holman Middle School, Christina Poelker, bus driver, Sue Mathis, math and engineering teacher at Pattonville High School, Amy Bopp, paraprofessional in the early childhood program, Kathy Webber, paraprofessional in the early childhood program, and David Duncan, library and technology aide at Willow Brook Elementary School; and back row, Raymond Braun, technology support specialist at the Pattonville Learning Center, Kimberly Thompson, reading specialist at Willow Brook, Stacey Hill, English Learner teacher at Bridgeway Elementary School, Dr. Cara Hiripitiyage, director of secondary education, and Rebecca Klenke, secretary in the technology department at the Learning Center. Celebrating five years of service in Pattonville were, from left, Jennifer Schmidt, paraprofessional at Remington Traditional School, William Dinsmore, custodian at Willow Brook Elementary School, Paul Haag, custodian at Bridgeway Elementary School, and Cathy King, custodian at Rose Acres Elementary School. Officers of organizations that support Pattonville schools were honored. They include, from left, front row, Gabriela Knize, co-secretary of the Willow Brook PTO, Pat Bryant, secretary of the Pattonville Alumni Association, Jill Niedringhaus, secretary of the Parkwood PTA, Cindy Schuster, second vice president of the Willow Brook PTO, Paula Schneider, president of the alumni association, Deirdre Rodgers, volunteer coordinator for the High School PTO, Maribeth Esteep, secretary of the High School PTO and treasurer of the Band Boosters, and Amy Menton, first vice president of the Willow Brook PTO; middle row, Marilyn Haynes, treasurer of the alumni association, Brian Kuhn, vice president of the Parkwood PTA, Jeannie Pursley, president of the High School PTO, Cheryl Sprengel, president of the Pattonville Education Foundation, and Dean Linhardt, vice president of the alumni association; and back row, Shelli Greenblatt, president of the Willow Brook PTO, Andrea Snowden, secretary of the Bridgeway PTO, and Laurie Lambros, vice president of the education foundation.